Knucklebooms to the Rescue - Iowa Mold Tooling Co., Inc. : Iowa Mold Tooling Co., Inc. Contractors are resourceful. When they need to get something done, they’re going to figure out a way to do it regardless of whether they have the perfect equipment. So most contractors aren’t a stranger to the idea of using equipment for tasks it isn’t meant for, but those same contractors usually recognize that they’re often pressing their luck. Utility Lines Construction Services was one such company. It wasn’t until they noticed a huge productivity leak that they decided to add articulating cranes to their equipment lineup. “Before we bought our knucklebooms, we were doing our heavy lifting with backhoes, and our productivity definitely suffered,” says Rick Chrissley, field supervisor with Utility Lines. Utility Lines, based in Buford, Ga., is a subsidiary of Asplundh Construction. Utility Lines specializes in installing underground and overhead power lines and does directional drilling for power companies in Georgia. The company used to do its heavy lifting with backhoes, which were technically supposed to be doing the digging, not lifting heavy components during utility line construction. “Moving our reels of wires and transformers with backhoes was terribly inefficient,” Chrissley says. “Those backhoes are meant for digging, and so when we used to move our heavy items around with them, they’d have to stop what they were doing, and we lost productivity.” Also, depending on the size of the transformers, Chrissley says the backhoes were unable to handle the payload. So, it didn’t take a rocket scientist to notice they were experiencing too much downtime, and that’s when Utility Lines decided to purchase some articulating cranes and leave the heavy lifting to them. 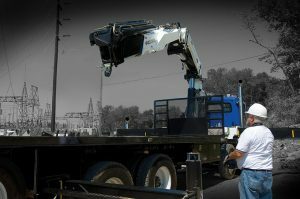 Chrissley had used Iowa Mold Tooling Co., Inc. (IMT) articulating cranes at his previous employer, and as soon as he saw the problems Utility Lines was having, he approached his boss about giving IMT cranes a try. They put their heads together to talk about their productivity problems and the various solutions available, and they decided that switching to IMT knucklebooms would be their best bet. Utility Lines has increased its fleet of IMT articulating cranes, and Chrissley says he’s been consistently pleased with the IMT cranes’ performance, durability, and reliability. “So far with the IMT cranes, I haven’t lost production or time, and I’ve been able to handle the task at hand without fail,” Chrissley says.